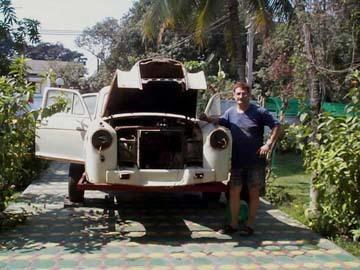 Thierry writes, "I bought the car dismantled in 1998. These are the first two photos taken when I finished cleaning the worst of the grunge off. 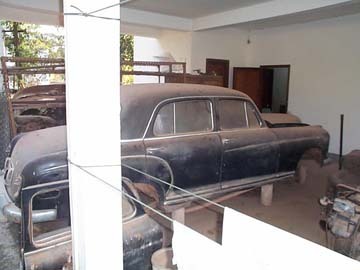 The body was used as a hen-house, and the two seats were in the owner's kitchen! 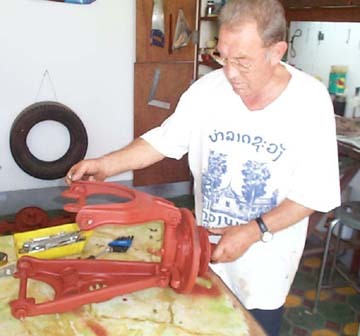 I had to make the wheels turn again as the brakes were stuck in the drums. Then I put new tubes in the tires and inflated them for the revival trip. I pulled the car home with a big truck full of parts retrieved from everywhere around the owner's house. 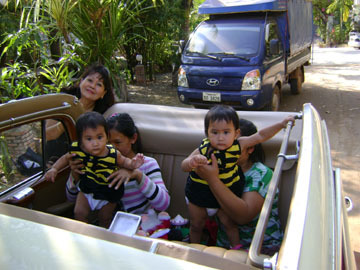 Everybody was laughing at me arriving at home. 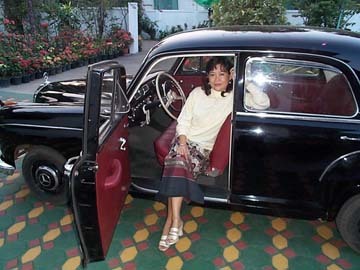 My wife hated me when she saw the car among our flowers. 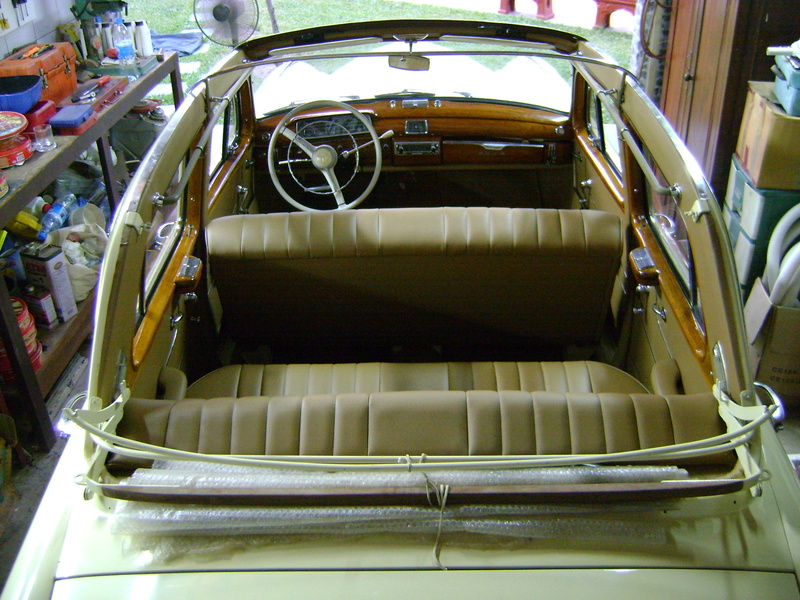 I had a few long, fun weekends of cleaning and refurbishing." 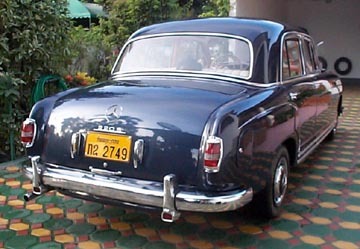 "This is the 190 with the 220S trunk badge I found at the beginning – in the bits around the hen-house! 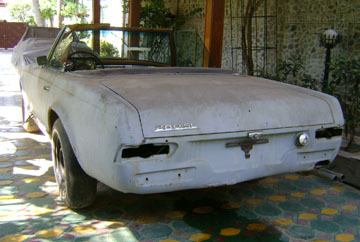 The old tail light lenses were faded from the sun. 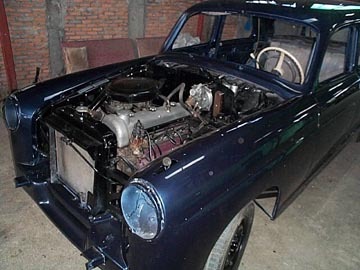 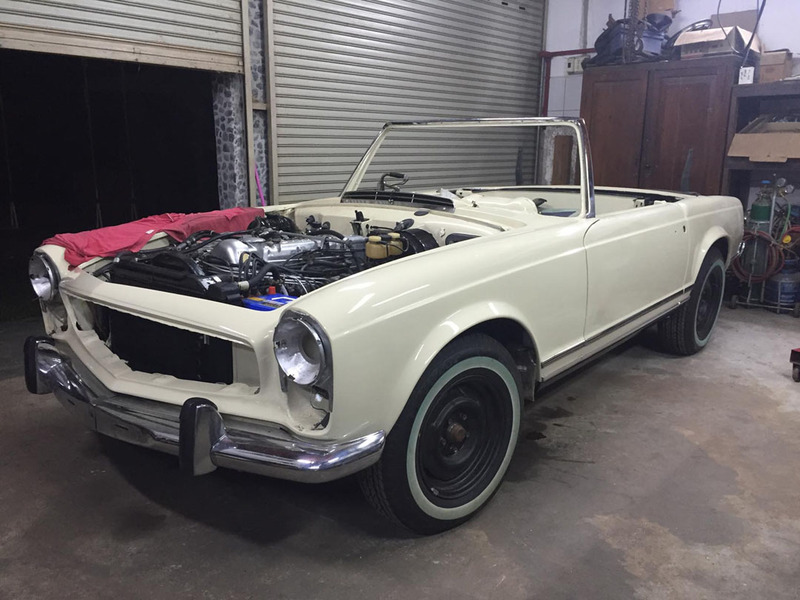 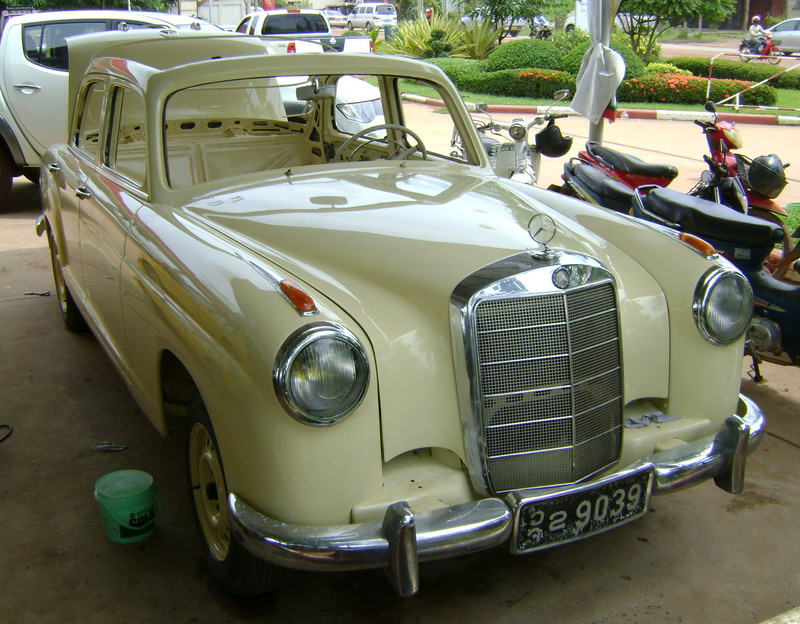 Finally, I got the car restored and running at the end of 2000." Then, my wife was proud and liked the car very much – I had to fight to sell it! 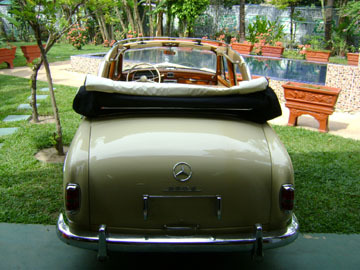 I used the car until September 2001 to go to work every day. 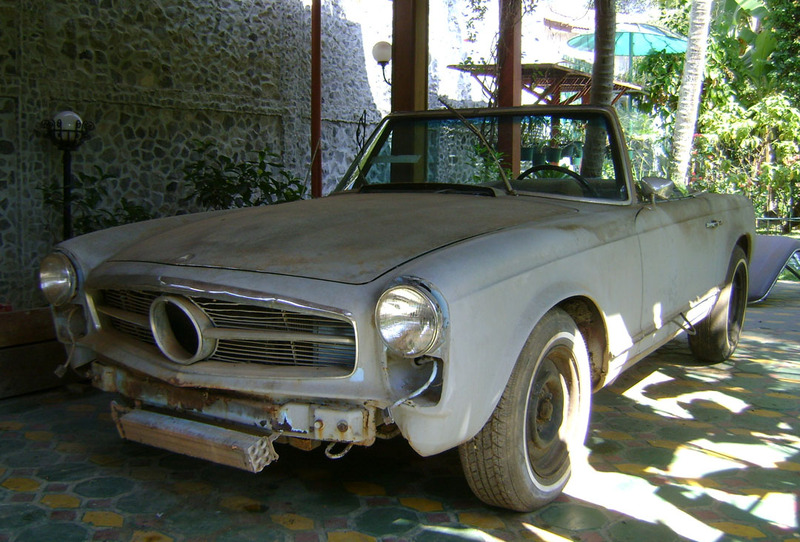 Finally, I sold it to my friend Pierre, who will take care of its future. 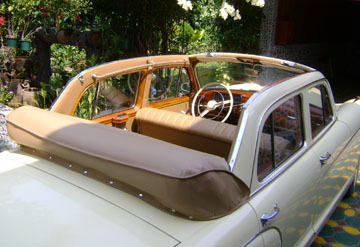 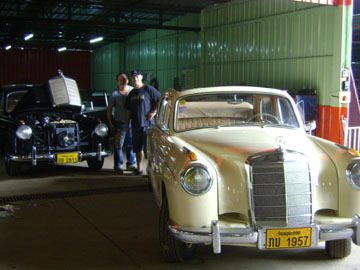 Foreground: 1958 Mercedes-Benz Type 190 sedan formerly owned and restored by Thierry (see above). 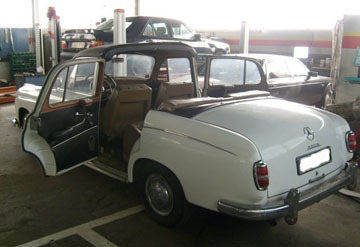 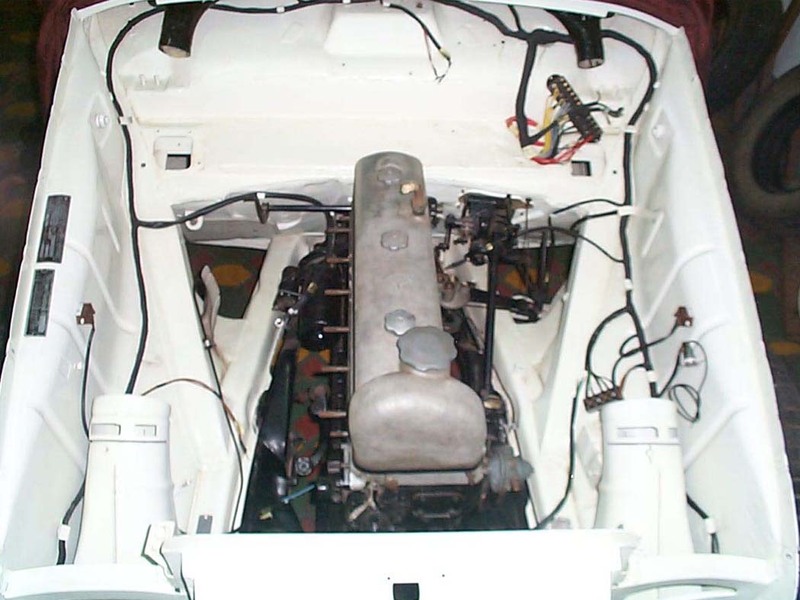 Behind the 190 is a Type 220S sedan owned by Thierry. 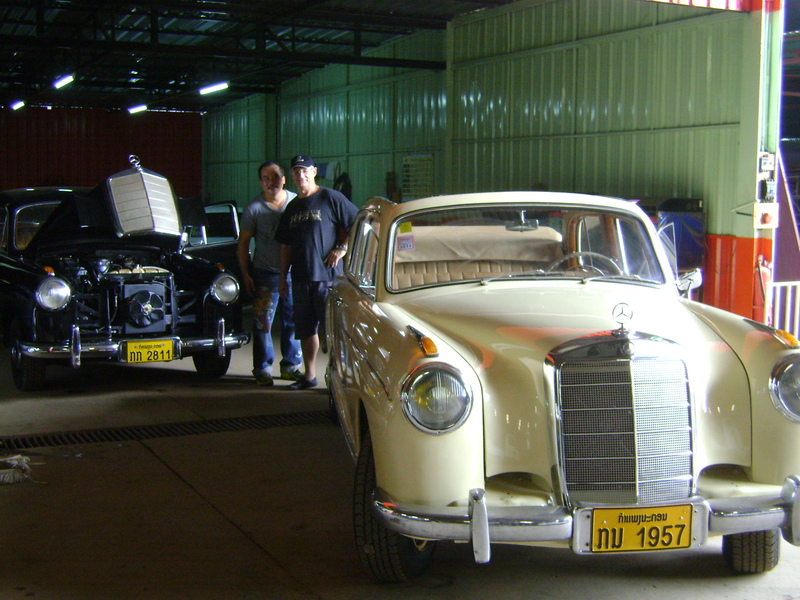 In the background is a 1957 Mercedes-Benz Type 220S project car (on trailer). 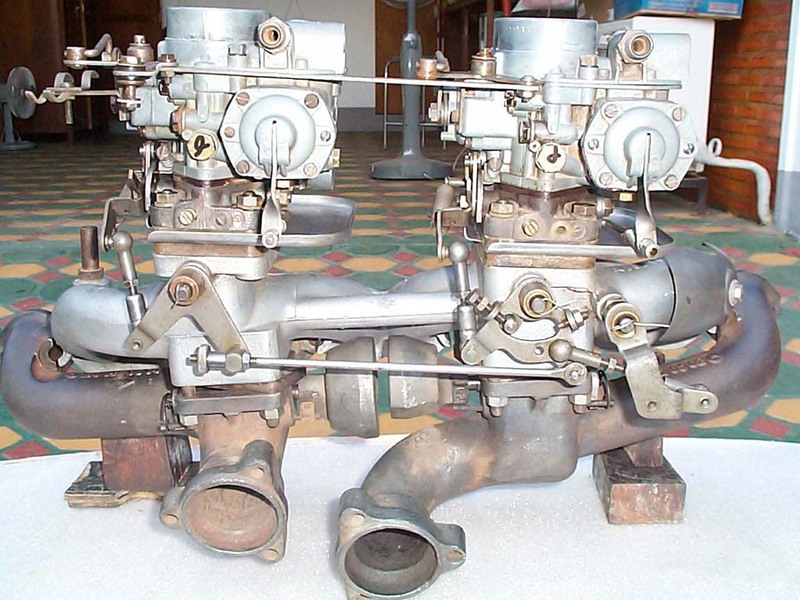 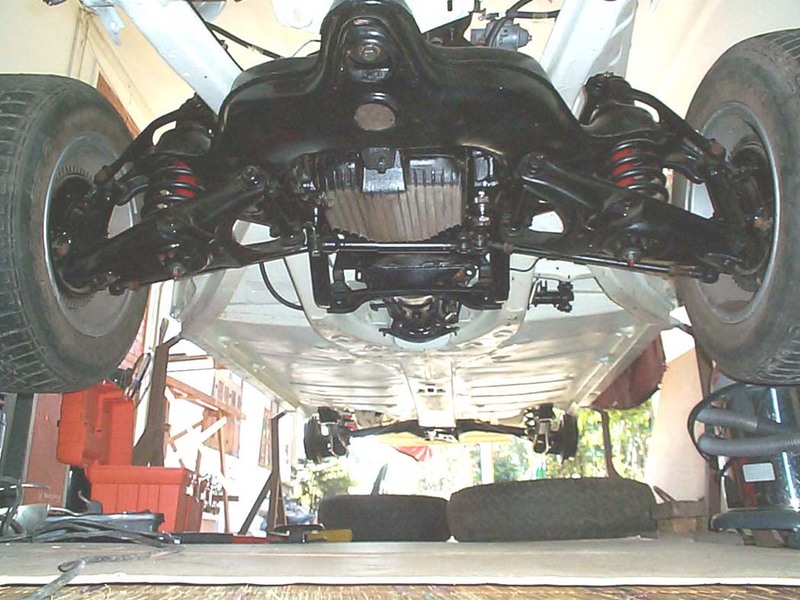 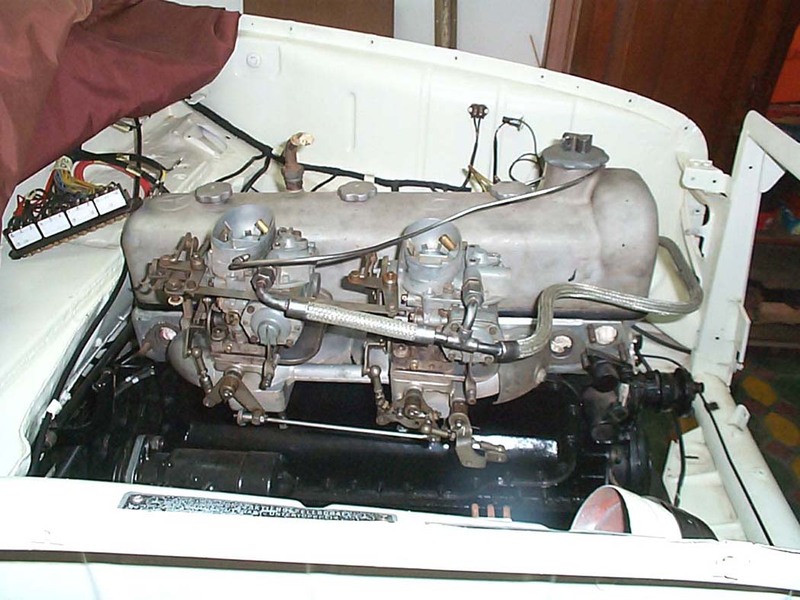 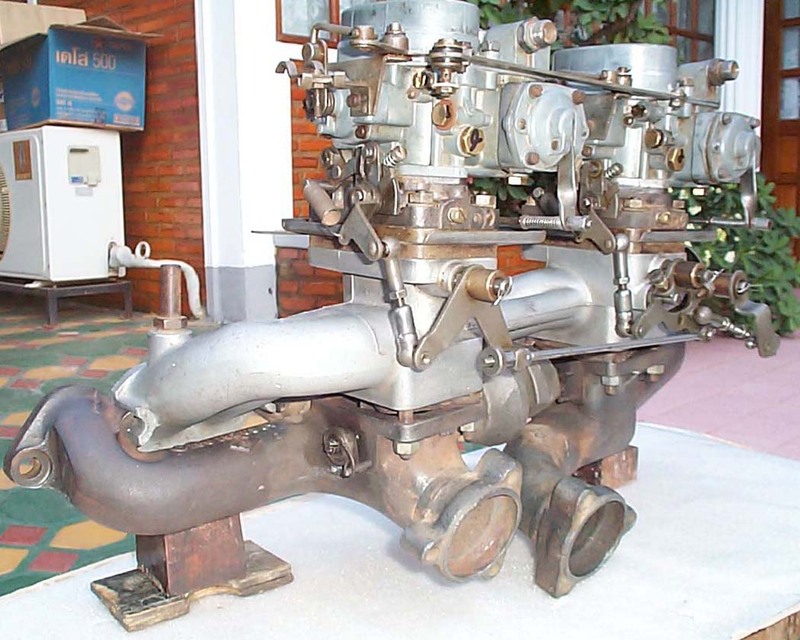 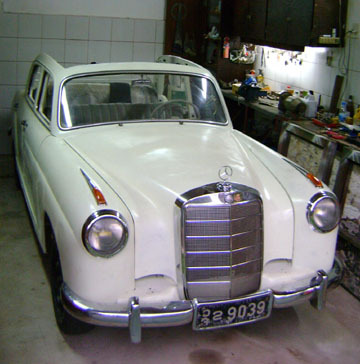 Thierry writes, "In January of 2002, I finally made a deal to buy 10 year's worth of Mercedes-Benz parts in storage from another fellow 220S Ponton fan. 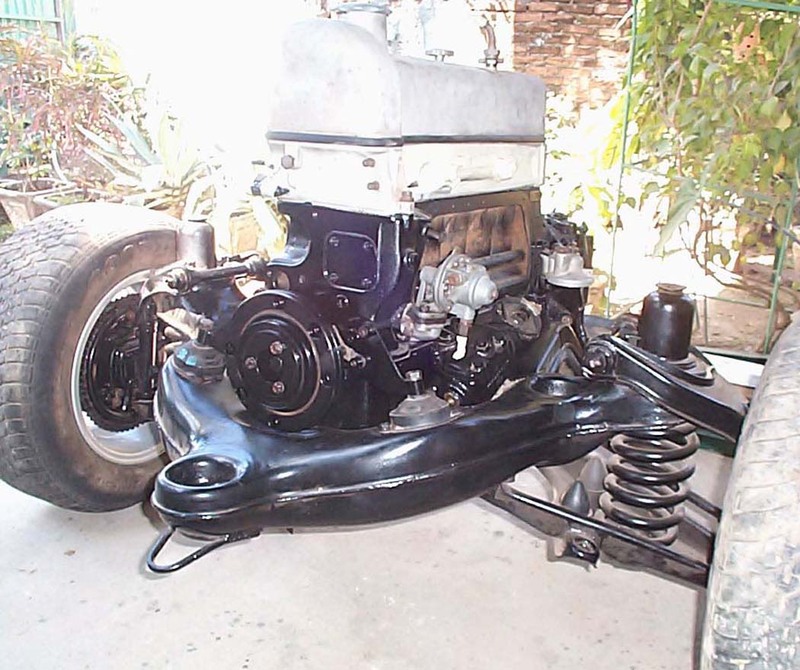 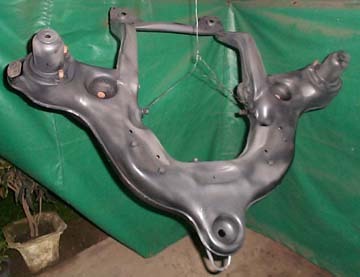 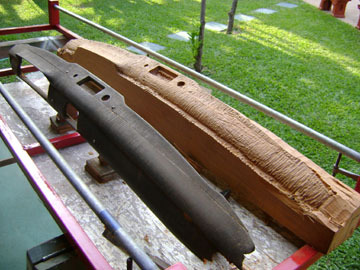 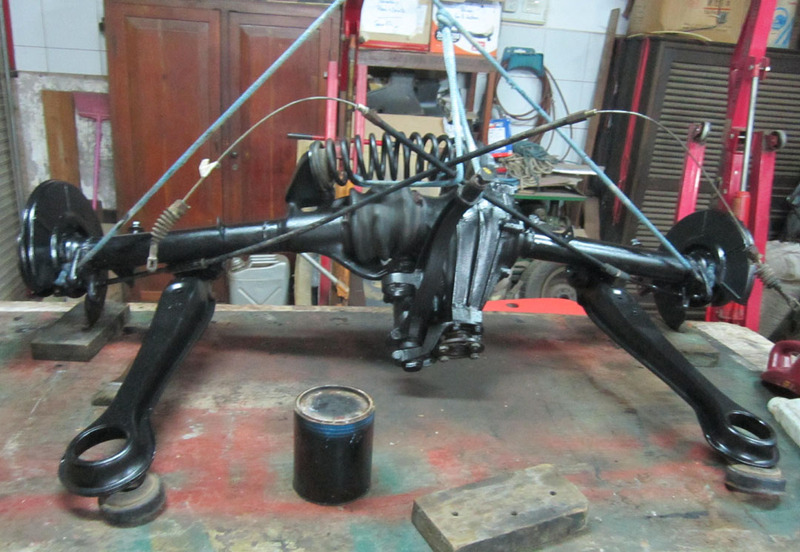 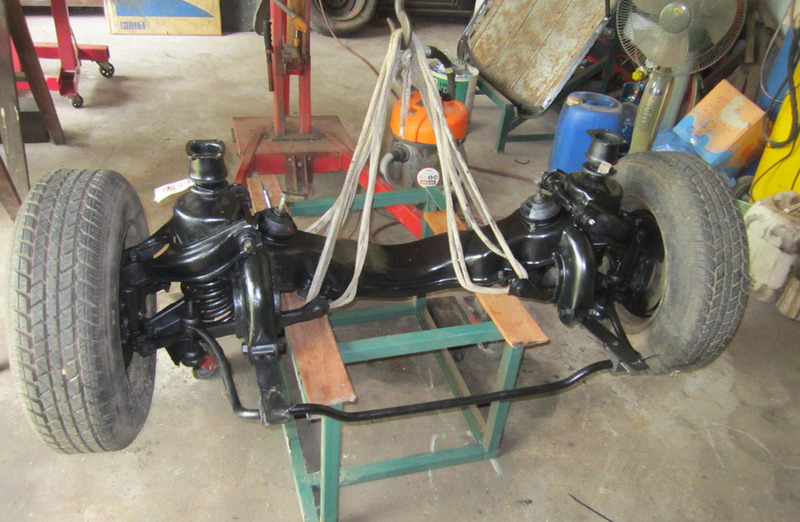 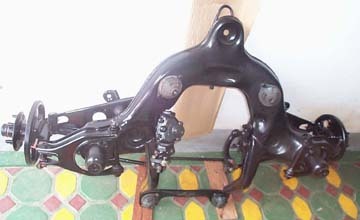 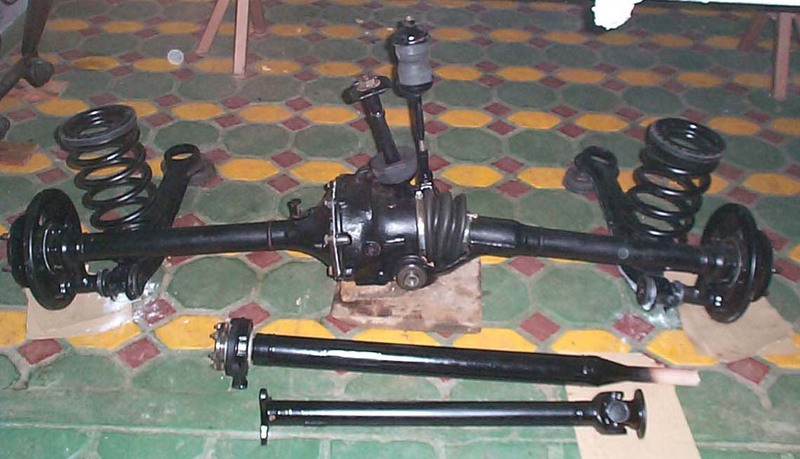 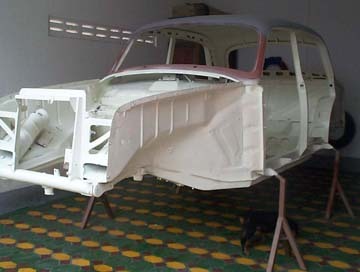 Now I have got the lot of parts, and three frames at home to refurbish, and one body just for painting." 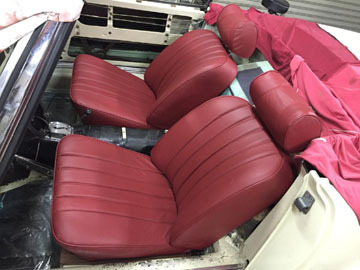 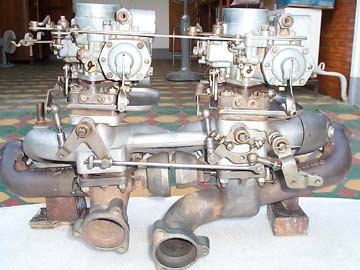 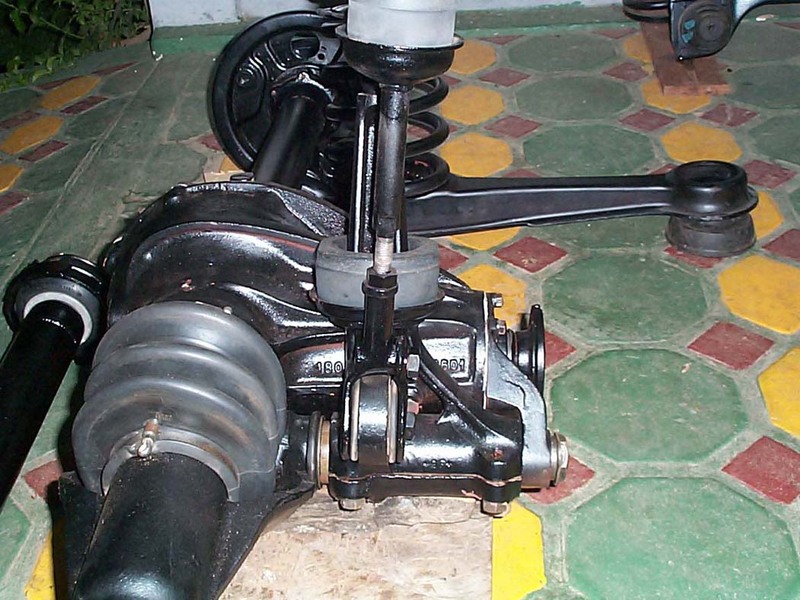 "This 1957 220S will be made new again with the parts of the 1957 220S in the photo below. 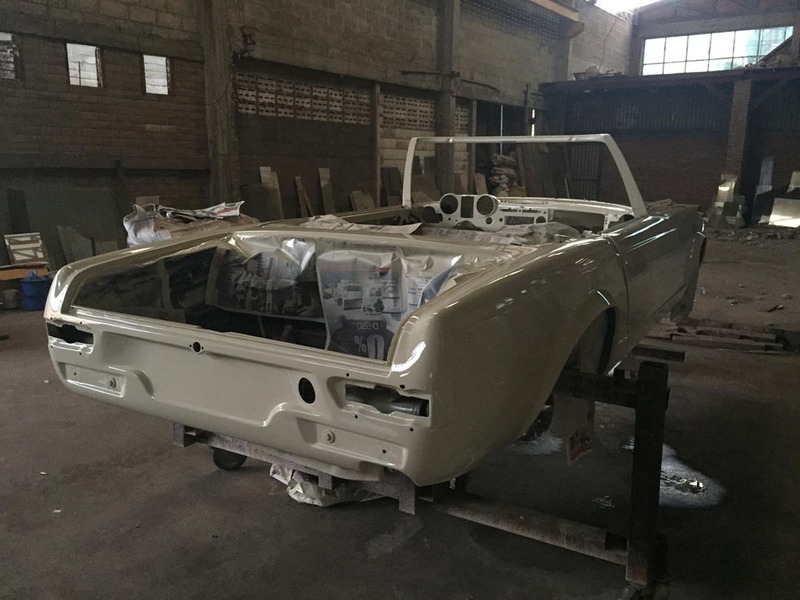 Then all the parts, and the remaining body should make the third 220S with a lot of time and effort." 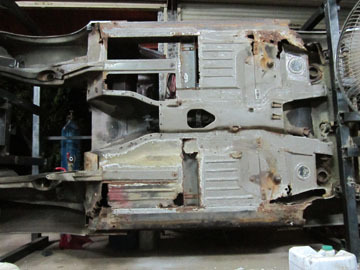 This 1957 220S will yield parts for the 1957 220S (on the trailer, above). 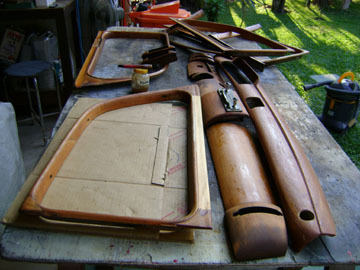 I just took a few remaining bits from the 1956 220S (above) and threw the rest away. 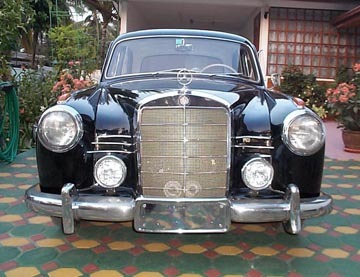 So, I still have a lot of work to enjoy for a while, but I can still drive this 220S in the meantime! 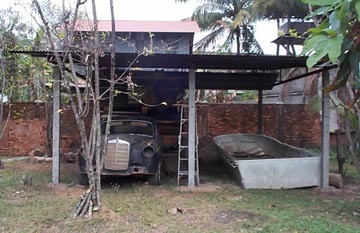 A shelter Thierry built for his 220S project. Making some progress with the paint. 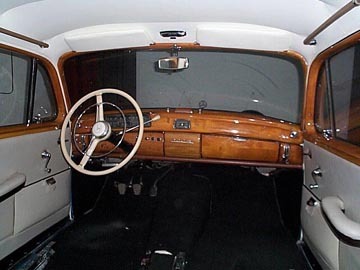 Very nice job on the woodwork too. 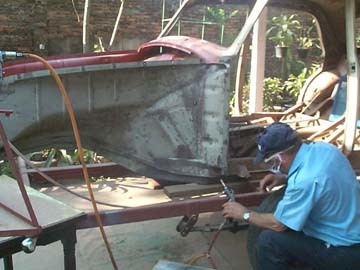 June 24, 2002: The 220S is starting to look roadworthy again. Maybe it still needs some glass and seats and interior trim. Thierry says it should be finished in another month or so. 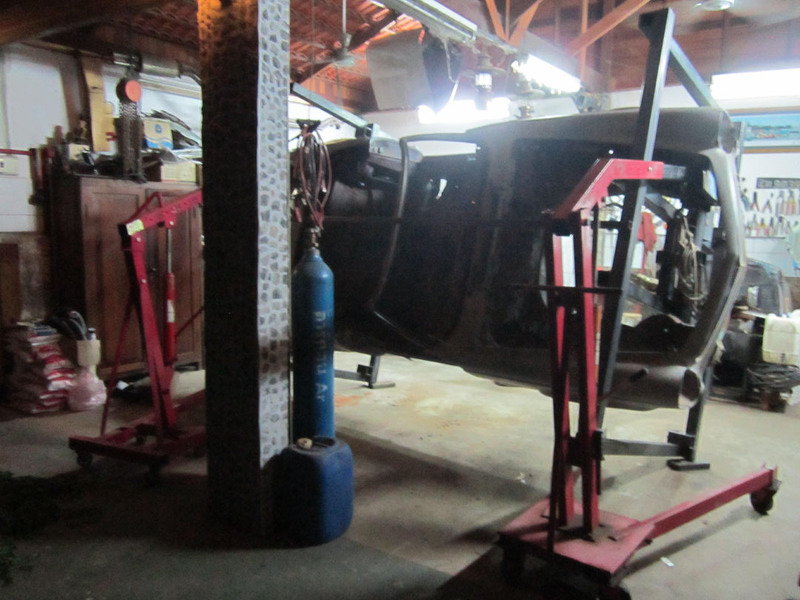 He has two more 220S sedans to work on after that. 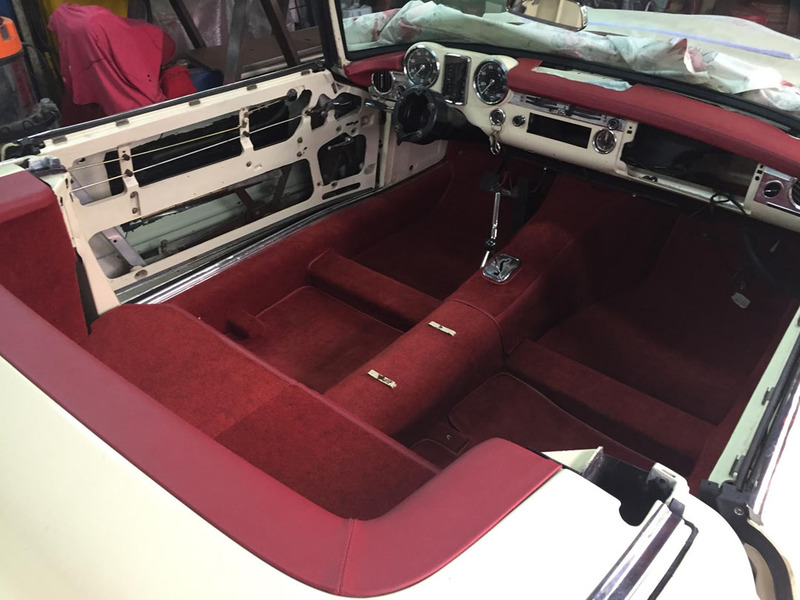 Making good progress on the interior of the 220S. Here is the 1957 220S at 99%, because there is always something to fix! 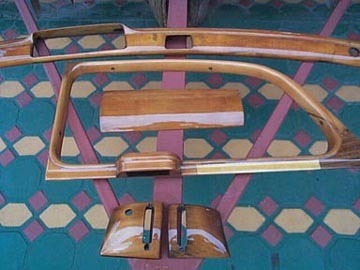 It is missing the mirrors. 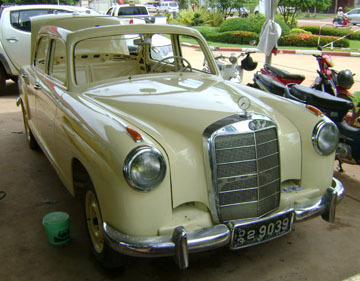 Now, this Mercedes-Benz is ready for driving to work every day. 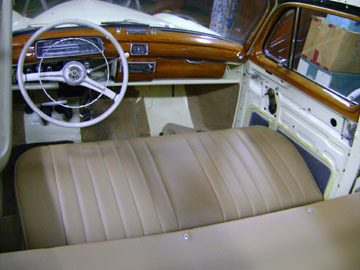 A rare bench seat with folding arm rest in the front. 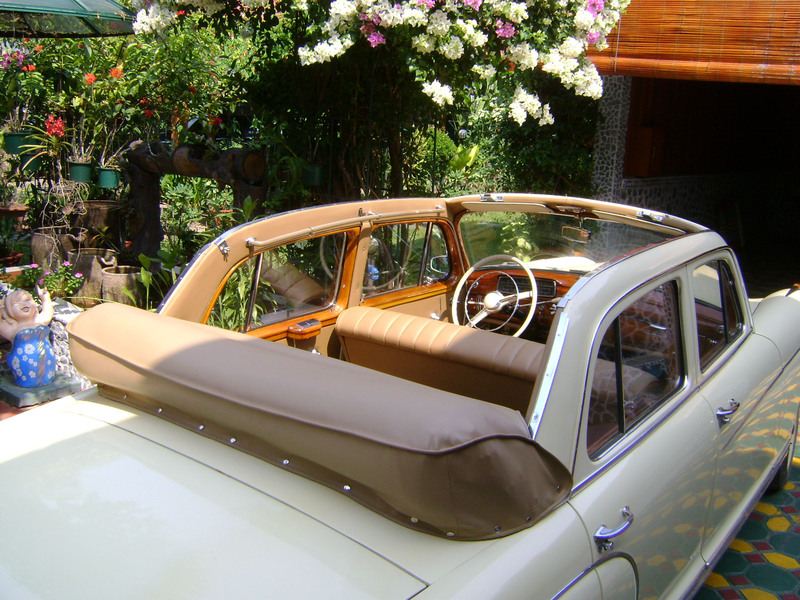 Everything looks fresh and new with this attractive color combination. 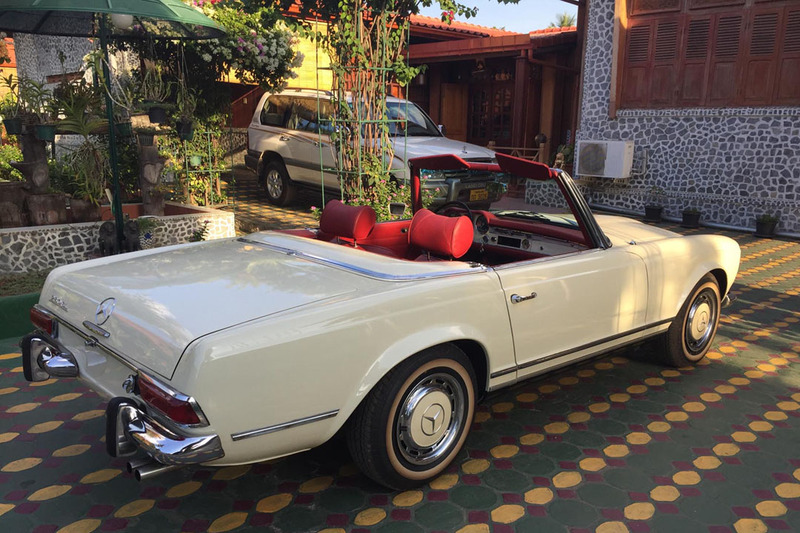 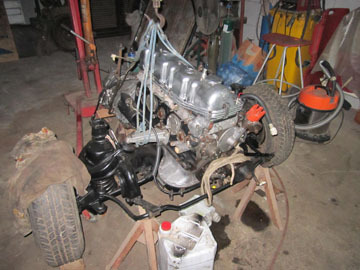 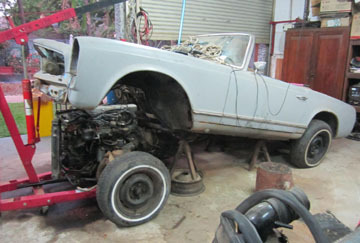 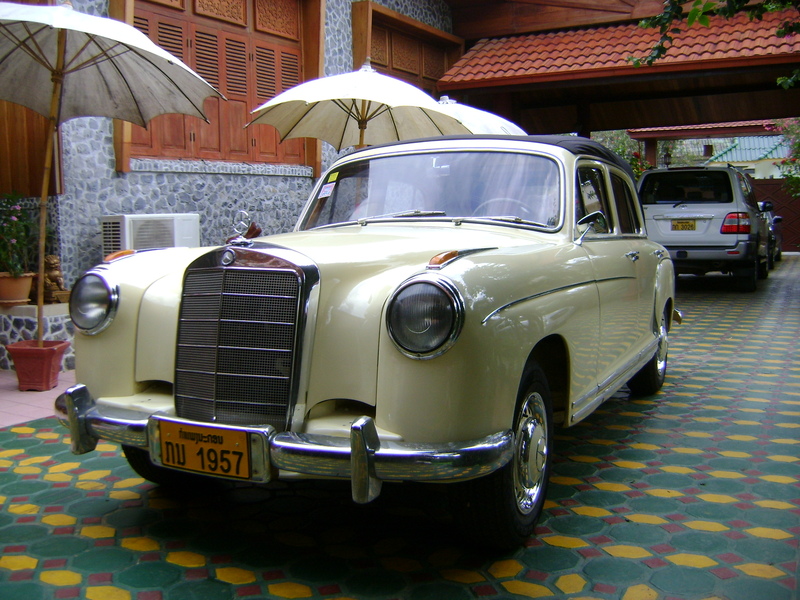 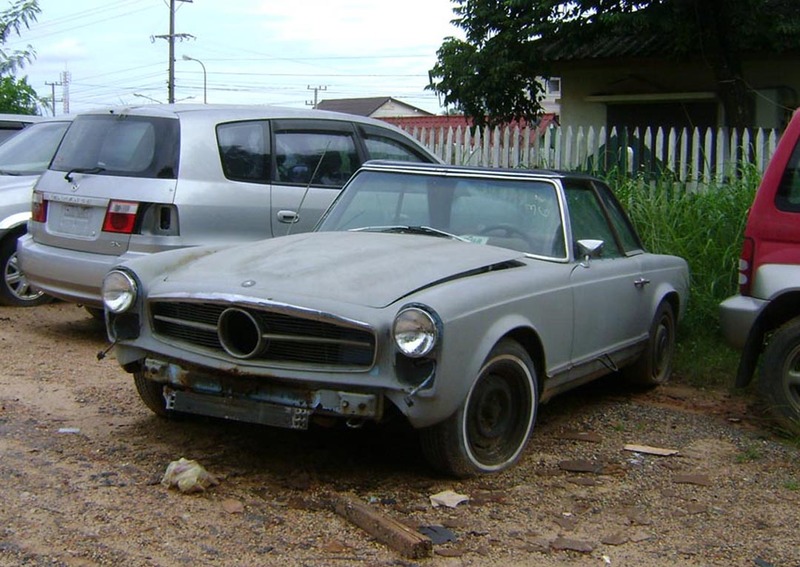 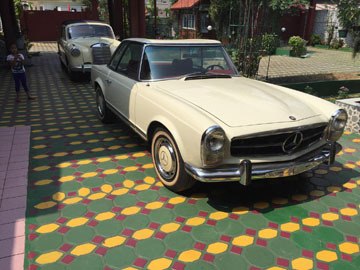 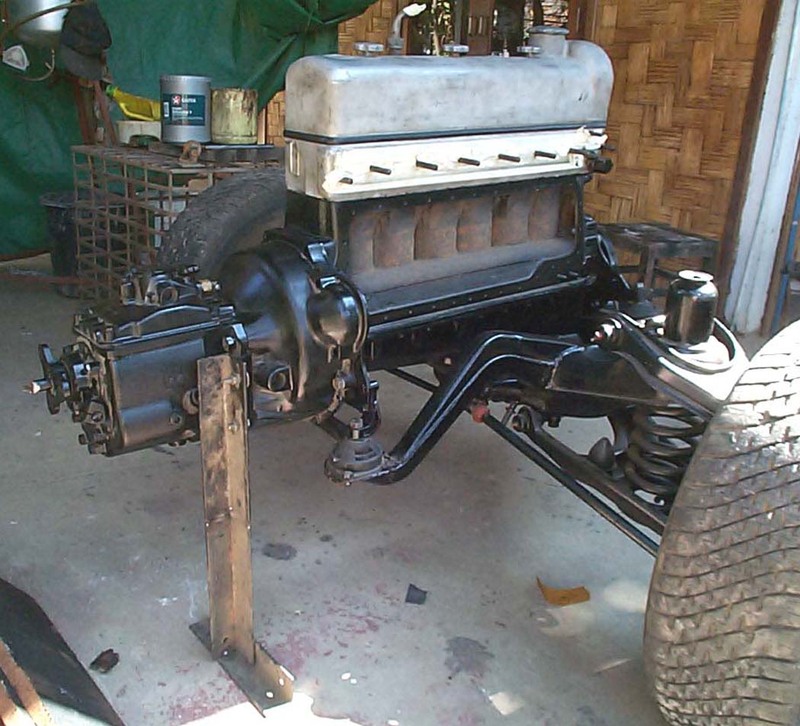 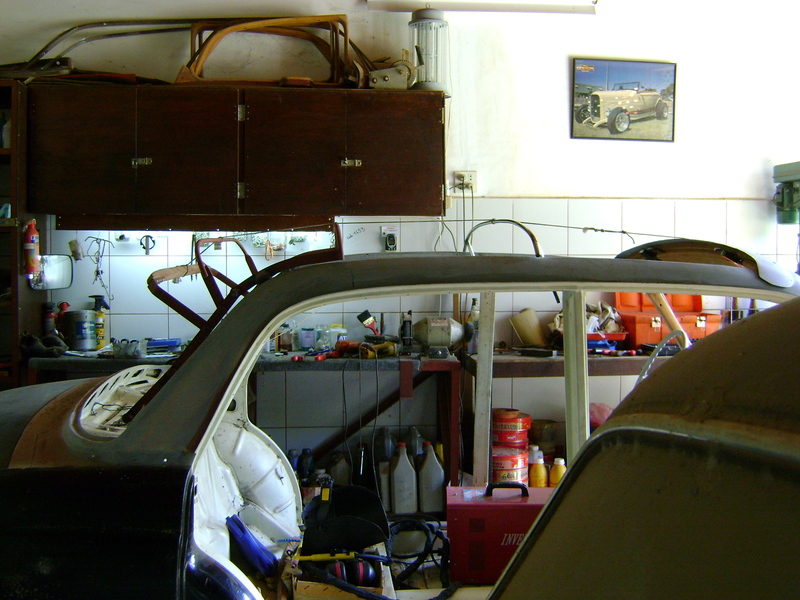 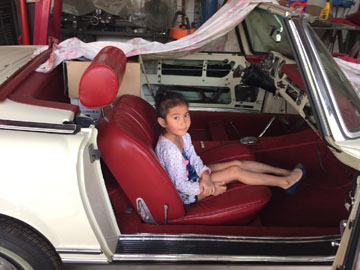 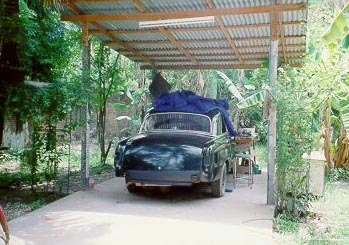 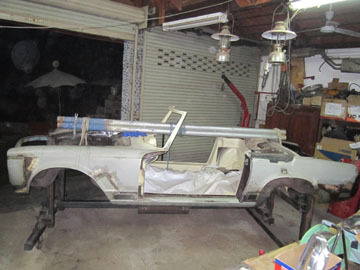 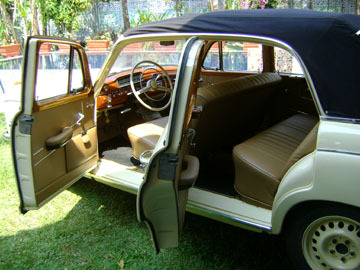 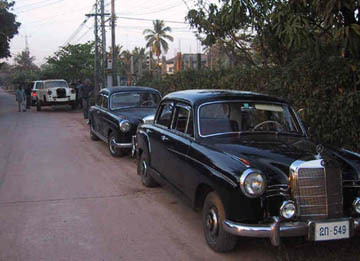 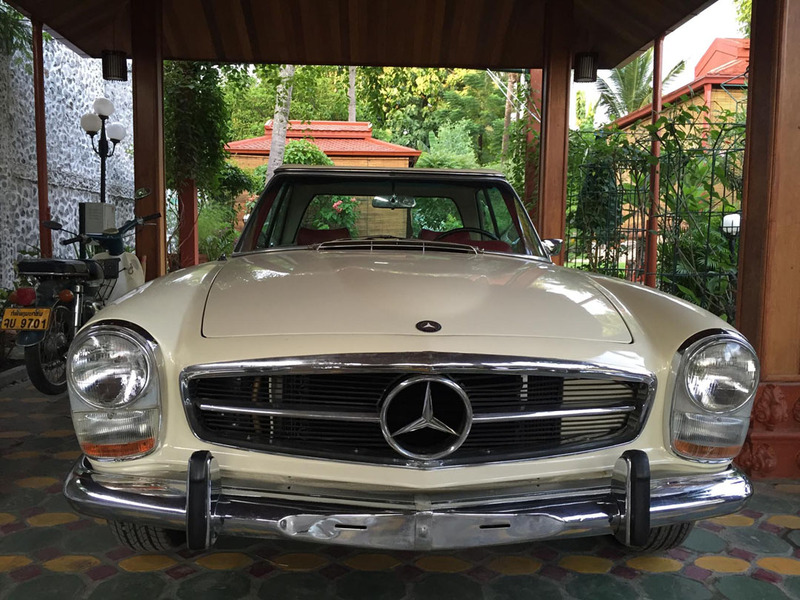 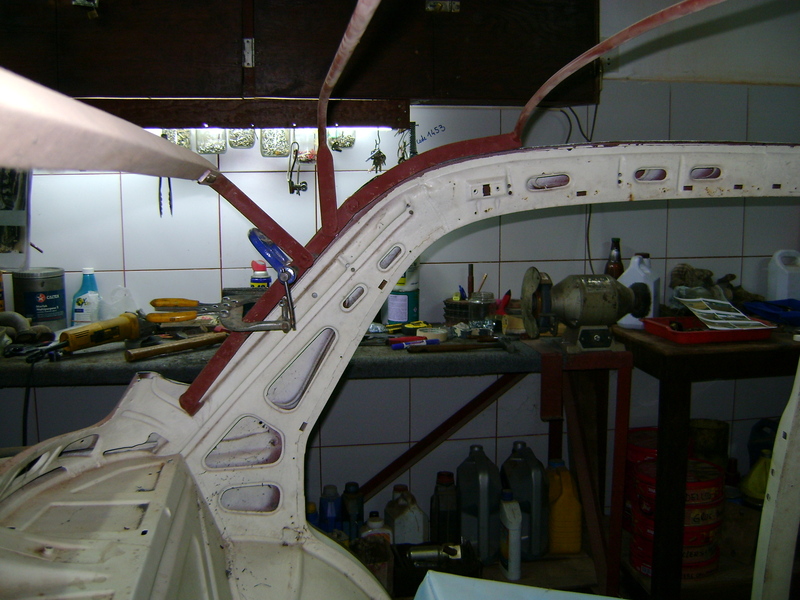 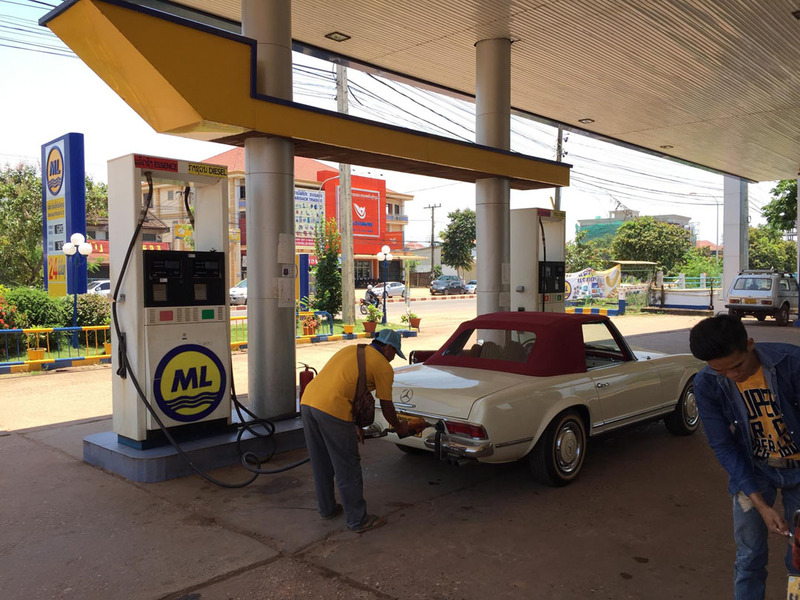 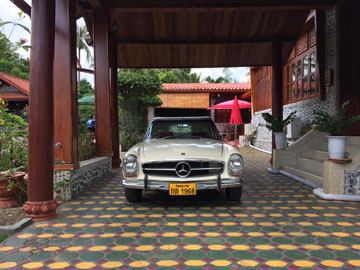 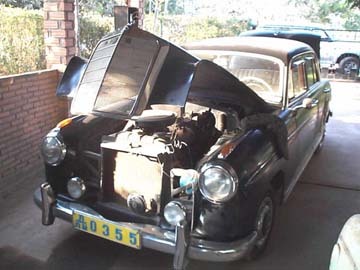 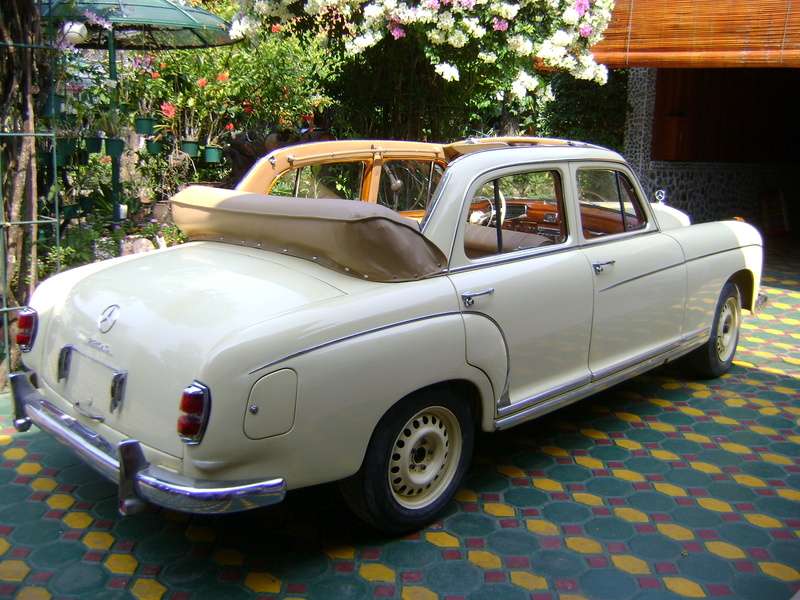 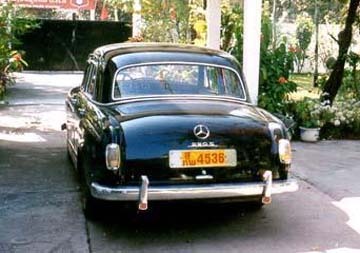 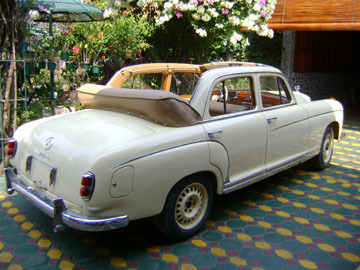 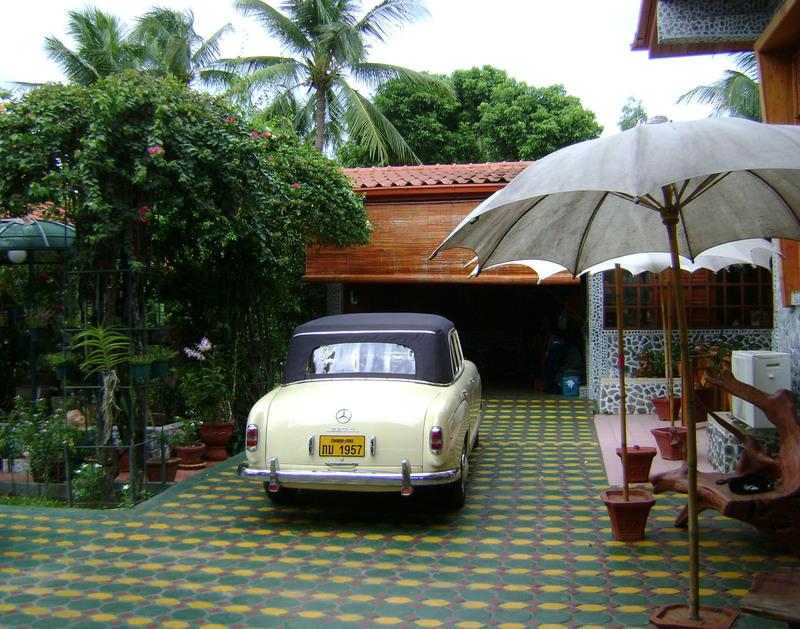 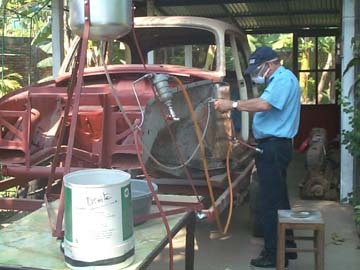 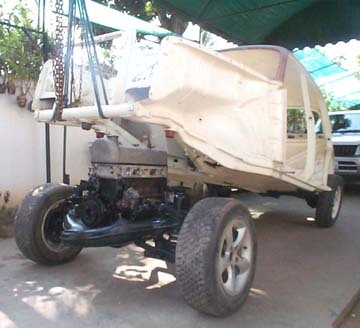 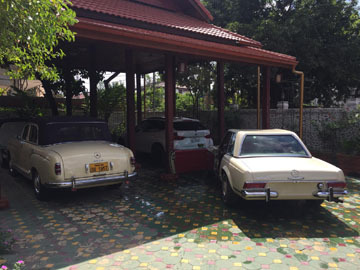 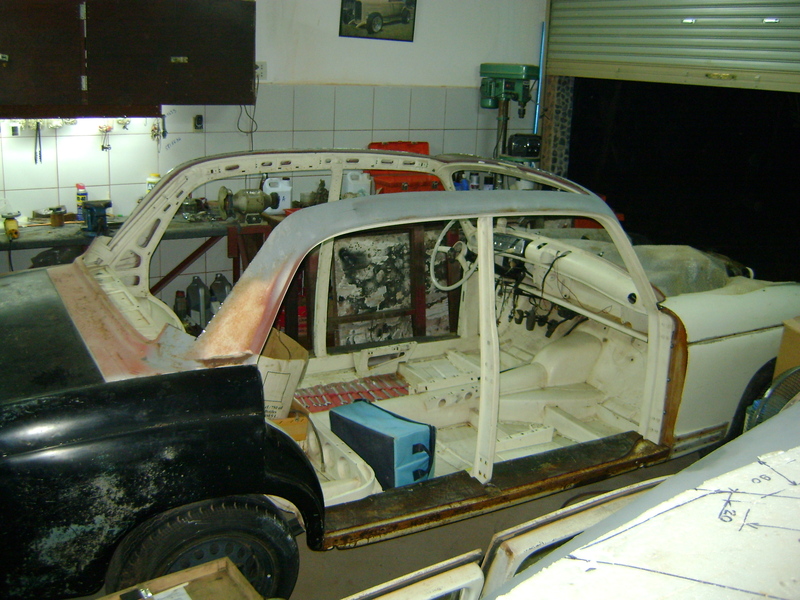 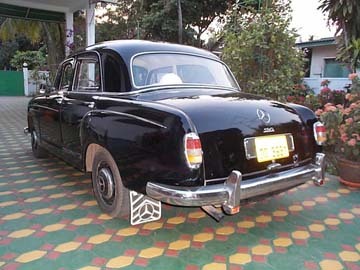 Thierry in Laos – with only two Mercedes-Benz Pontons left to restore. 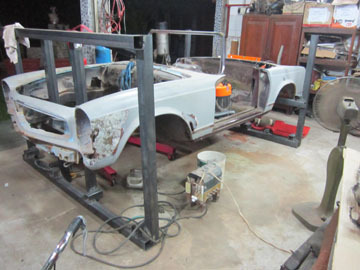 New floor panels being welded in place. 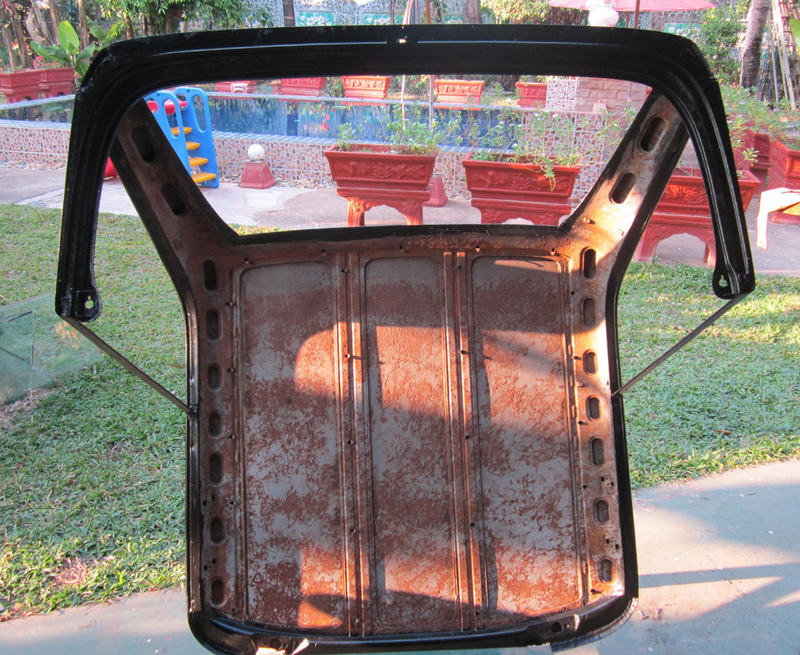 One way to cure the rust and corrosion is to patch in new metal. 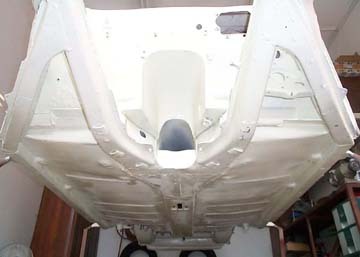 Sandblasting and priming the 220S body shell. 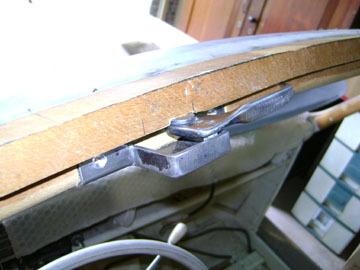 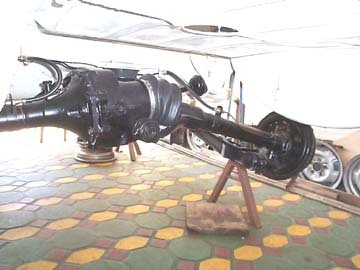 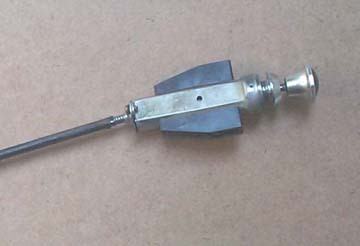 U-shaped sub-frame (the so-called "Fahrschemel"), rubber mounted to the shell at three points. It will hold the engine, gearbox, suspension and recirculating ball steering. 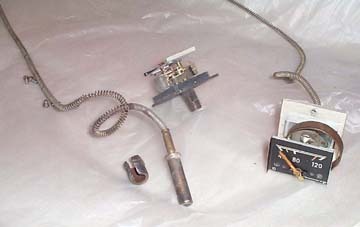 I found my choke cable to be rusted (as most are) and could not make anything from it. 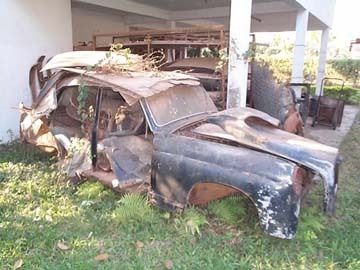 I went to my donor car but it had the same damage (of course!). 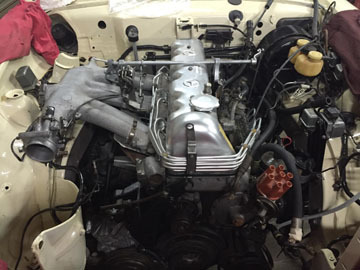 So I finally found out that the engine hood cable was the same and is never damaged. 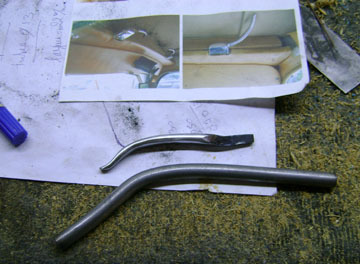 Furthermore it is longer, so making it into a new cable for the choke was possible. 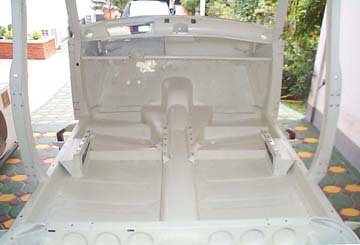 The results are very good. 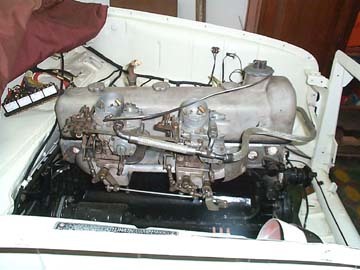 I also made it a little longer to better adjust it when it is finally installed on the carburetors. 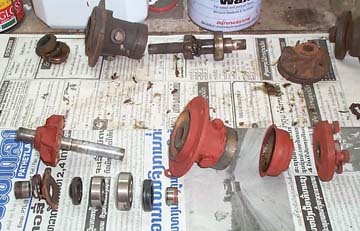 I had quite a difficult time removing the water temperature adaptor. 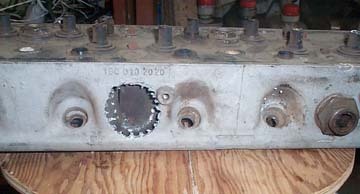 Finally I had to drill it out. 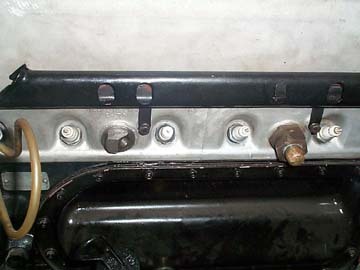 I also drilled out the replacement unit from a donor cylinder head (see photo above). 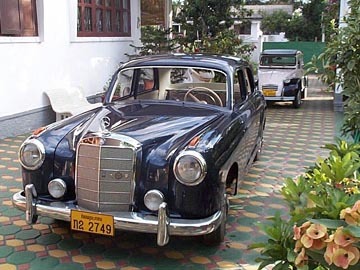 The découvrable (la découvrable) was an after-market product designed in the 1950s by the French company "Anciens Etablissements Ansart et Teisseire" (AEAT) and used on brands like Citroën, Peugeot, and Renault – but this is something new for a Mercedes-Benz! 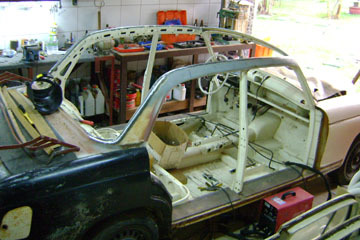 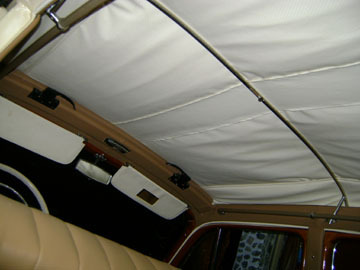 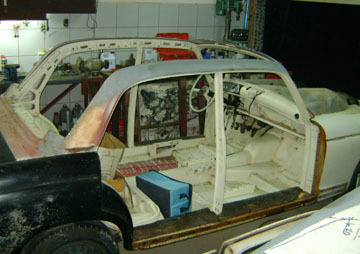 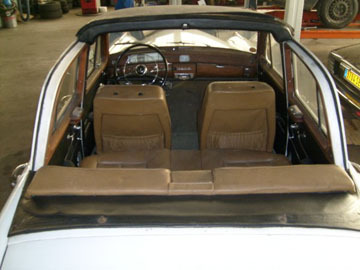 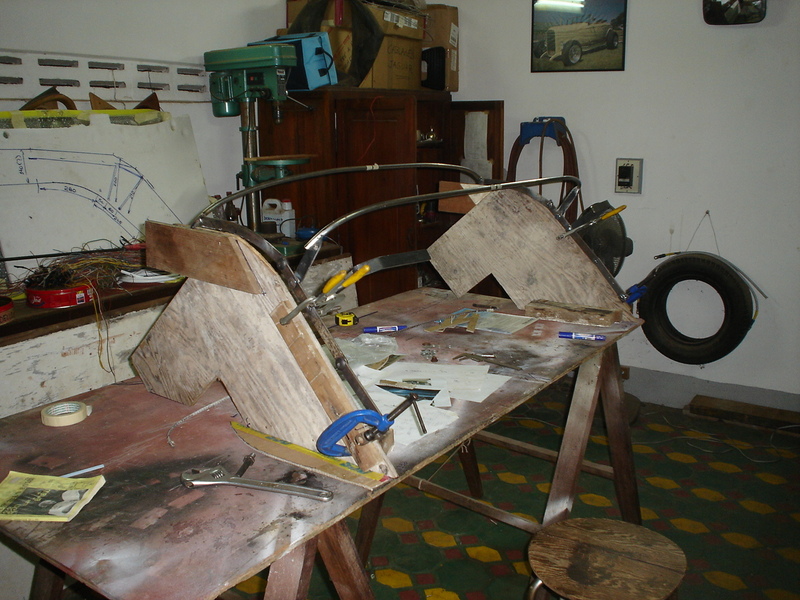 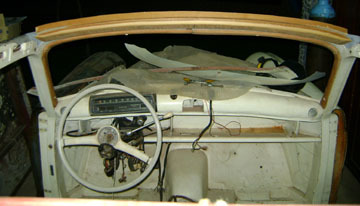 This shows the first step to design and build the support for the découvrable soft top. The big decision was made to cut, and introduce the 220S to some open sky! 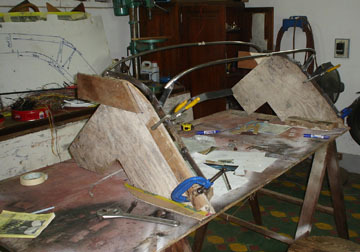 Fitting the mechanism to see if the design was accurate. 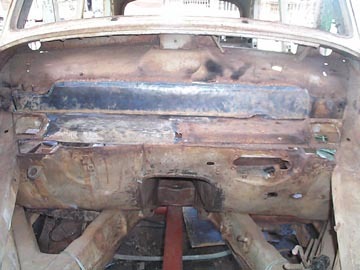 As it seemed right, I made the cuts clean by welding nice looking borders taken from the material on the cut roof. 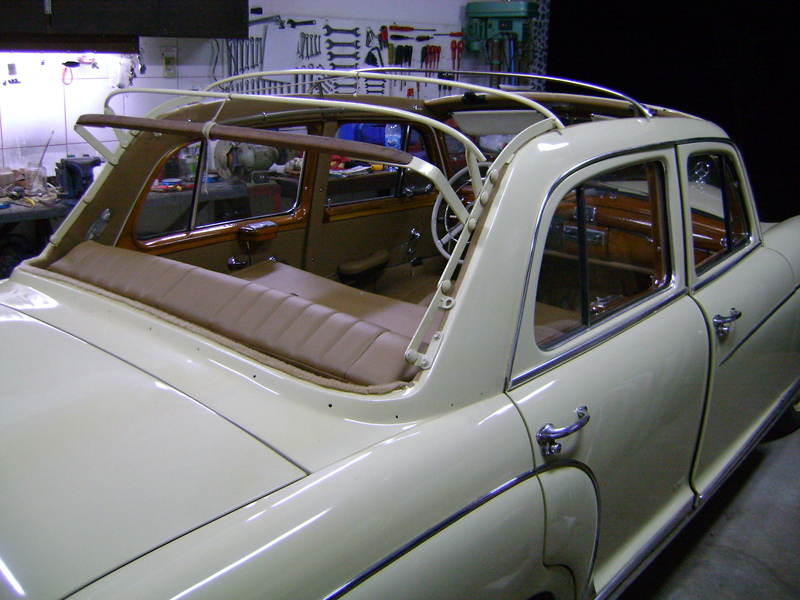 I cut a strong piece of wood to strengthen the front top structure and to enable fitting the locks for the soft top. I also used the curved/spherical sheet from the rear cut roof to make the removable front part of the soft top. 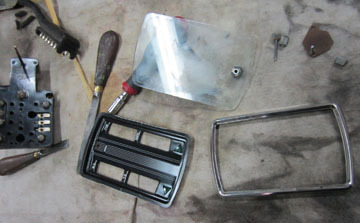 Since I didn't have the machinery to make such parts at home, I recycled the one available! I made the same locks as the original AEAT design, from scrap and they will be chromed later. Some paint to drive around (for road testing) after such a long restoration and transformation. 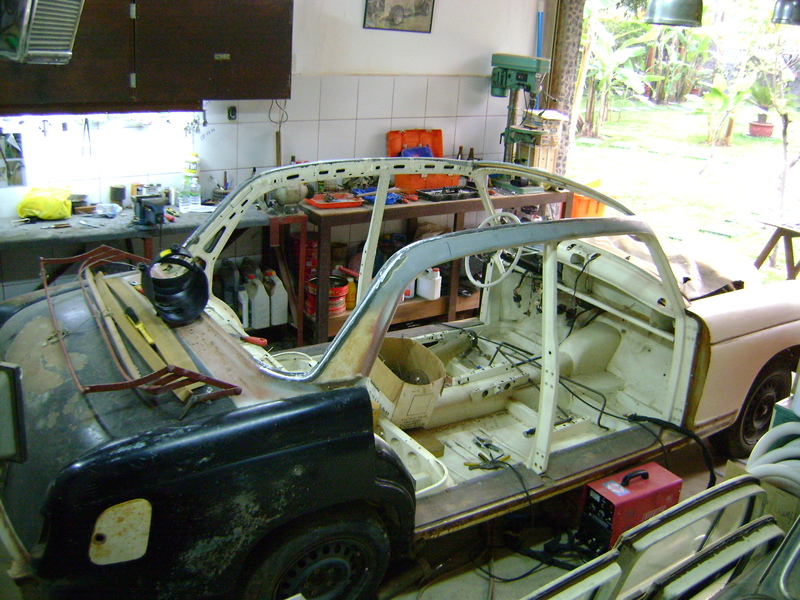 If everything is OK I will send the car to paint shop at last? The car tested fine, and then it went to the paint shop for the final look. 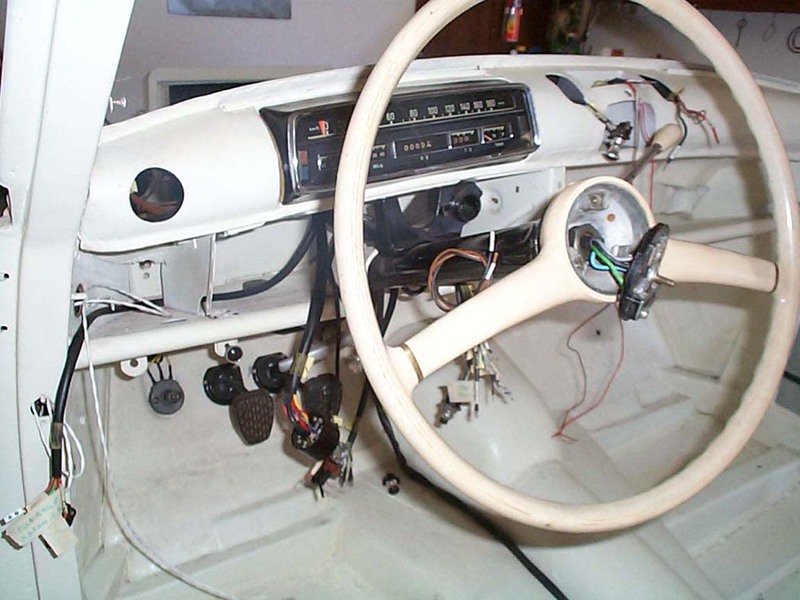 In the meantime I built a copy machine and made a new dashboard and other parts that didn't resist the old front window seal leakage and tropical rains. 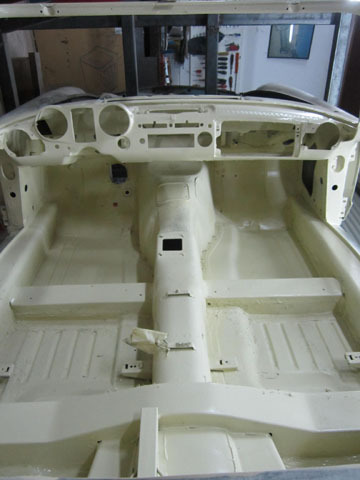 Looking good now – don't you agree? All put together with new upholstery. 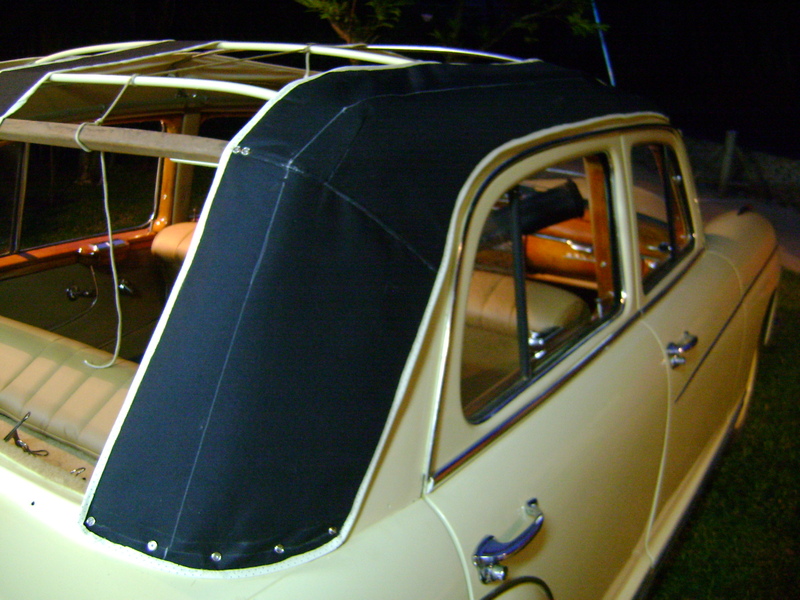 I just called my friend and we made cloth top like the original AEAT design. 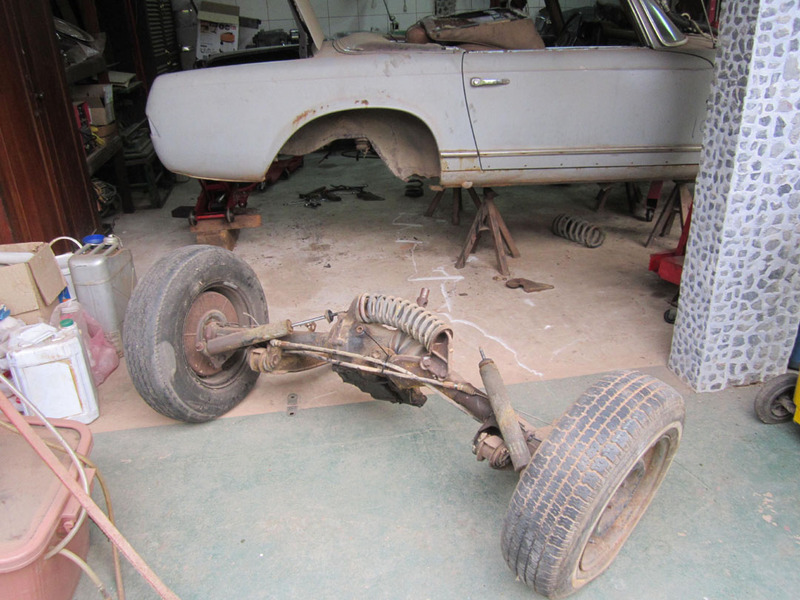 Need to find correct wheels and take it for the technical inspection so it can be licensed. My wife, the twins and the nannies seem to like it too. 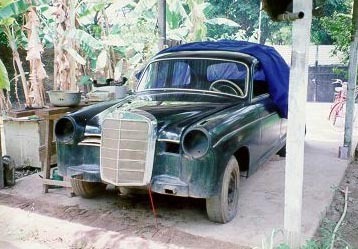 Am I in a dream?!?! 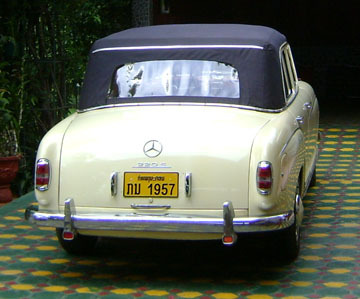 New tags with the car's birth year! 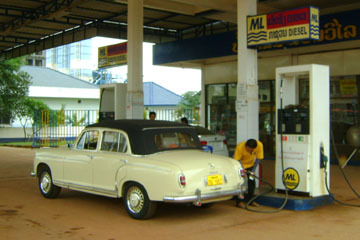 Refill carefully at my own station. 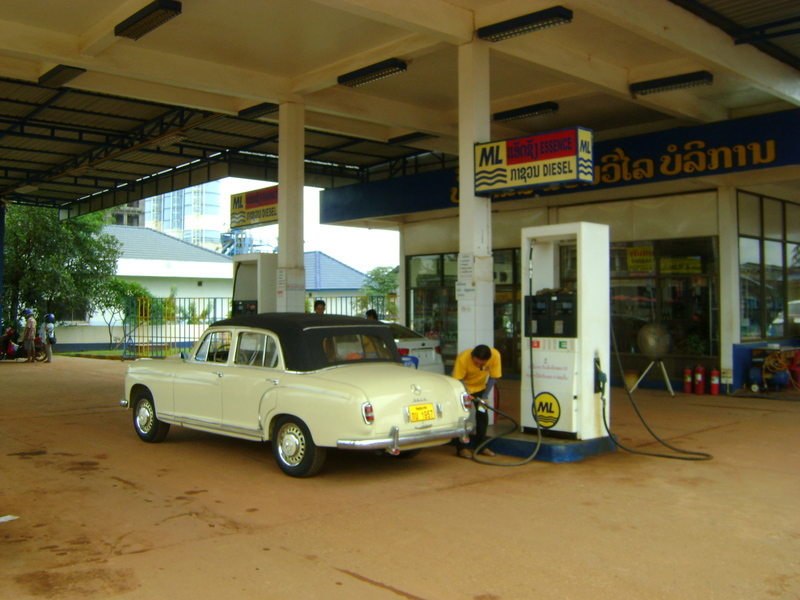 At least that way I am sure it is the best gas! 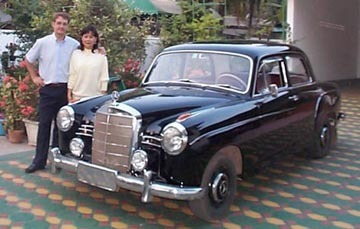 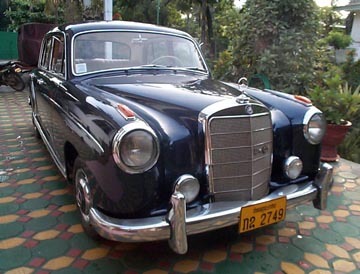 Enjoying time with my friend who just bought a Mercedes-Benz Type 219 Ponton. 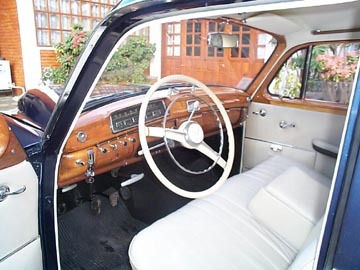 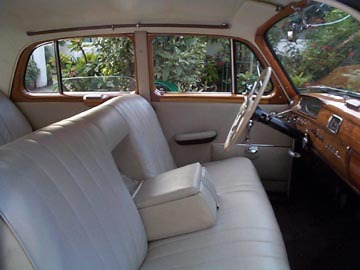 Separate front seats – because this Ponton découvrable (there is more than one!) is owned by someone else. 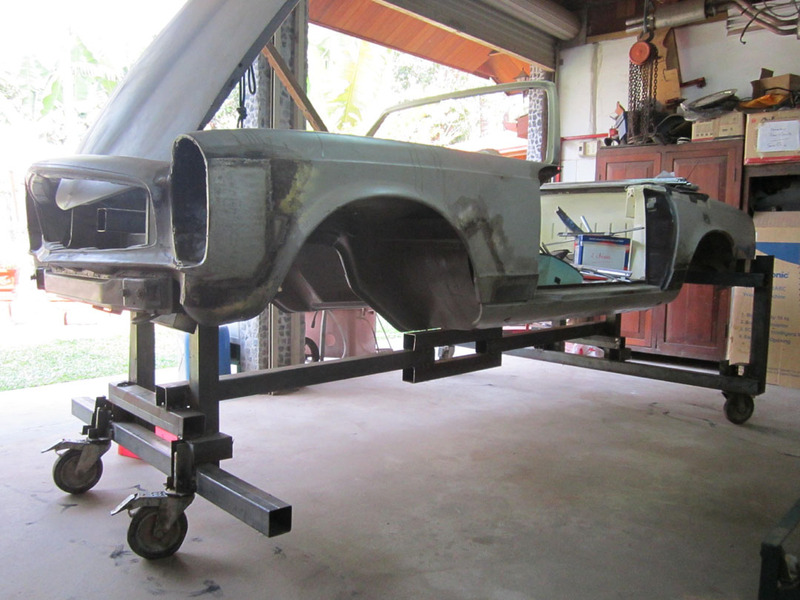 This is the story – in February 2011, I bought a 1968 280SL on the internet from New York. 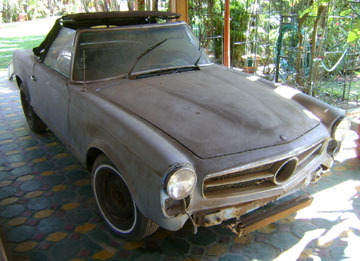 It was in running condition. 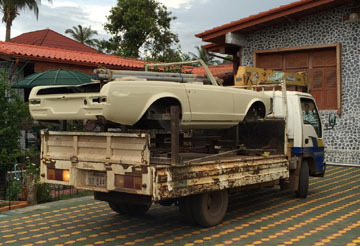 Three months later, it arrived in Laos' customs just after a new prime minister was nominated, and the tax laws were changed. 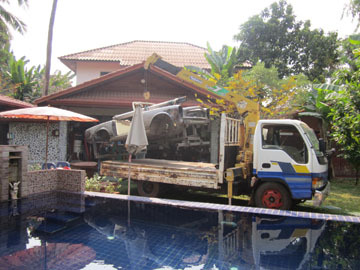 So after long negotiations due to the dramatic increase, the car finally arrived at home in January 2013! 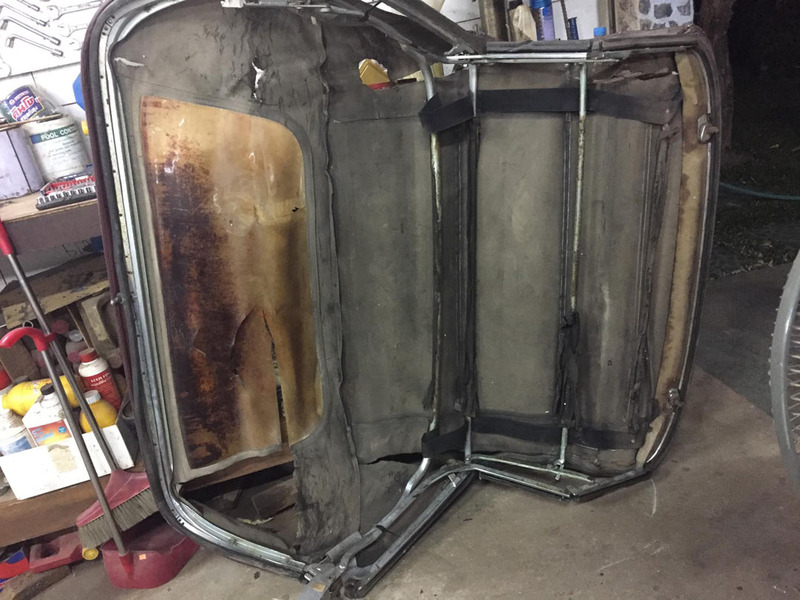 When everything was removed, I started making a rotisserie stand to gain access to the underside of the car. 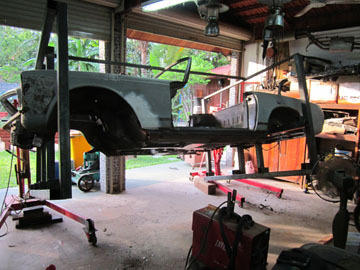 First flip-over with my two cranes. 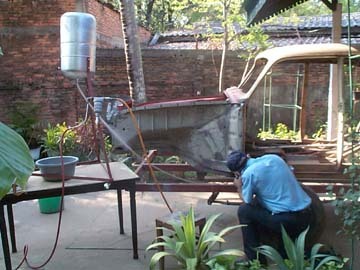 Better access allows the start of a long process. 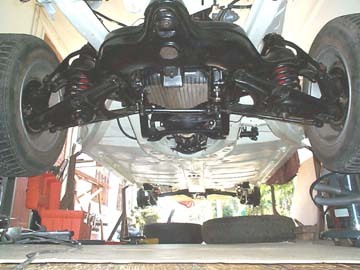 Flip over again and again. After long hours of cutting, forming, and welding, it looks better. 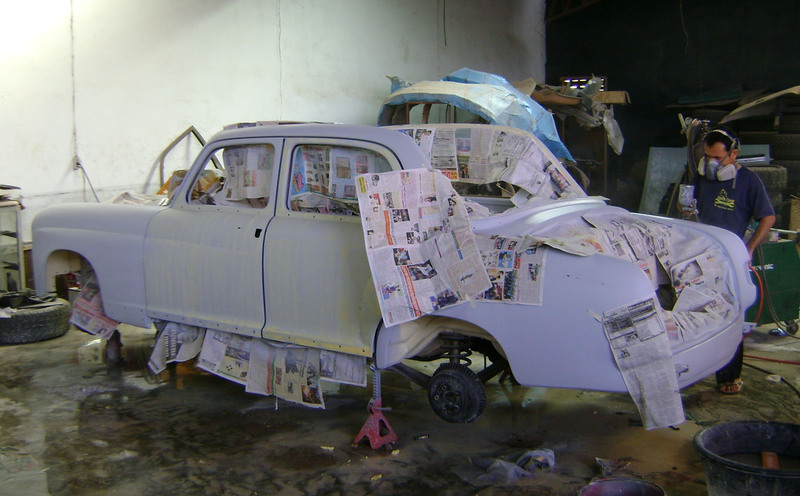 Nearly like the factory original! 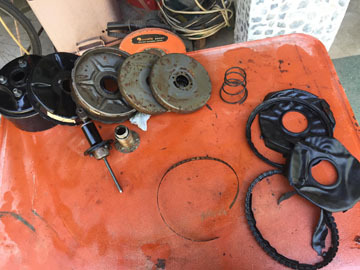 Many parts were cleaned and rebuilt to look new, and verified to function properly again. 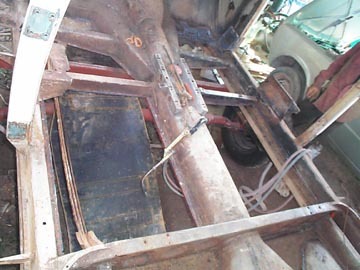 The stand was modified for easier mobility on wheels. 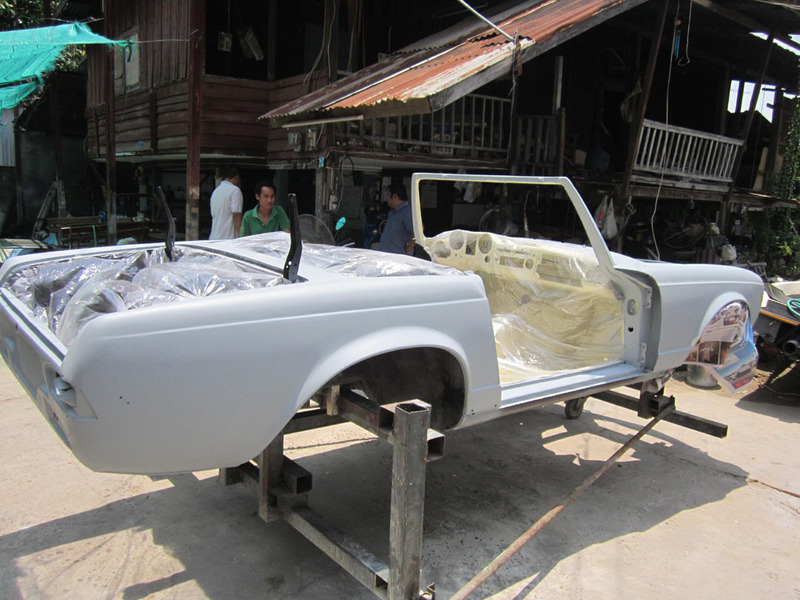 Off we go to the paint shop! In the meantime, larger parts were refurbished. 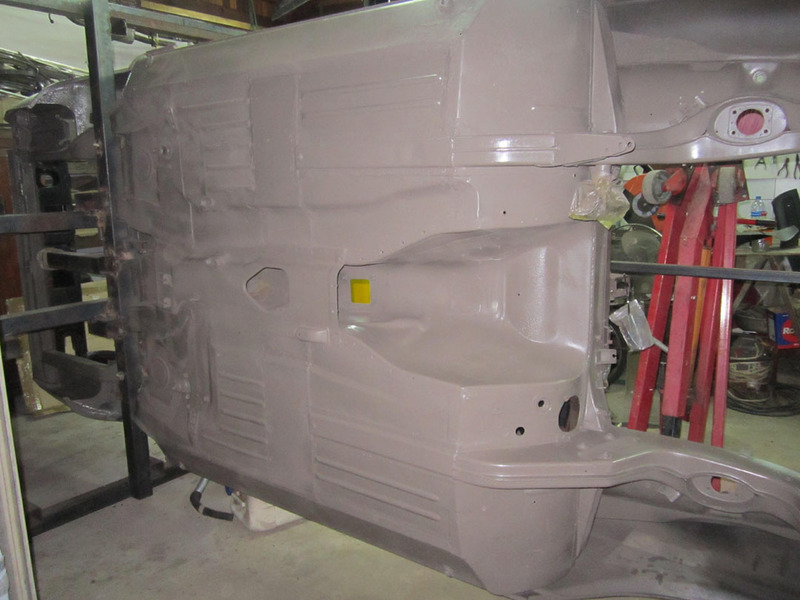 The paint shop was making progress. 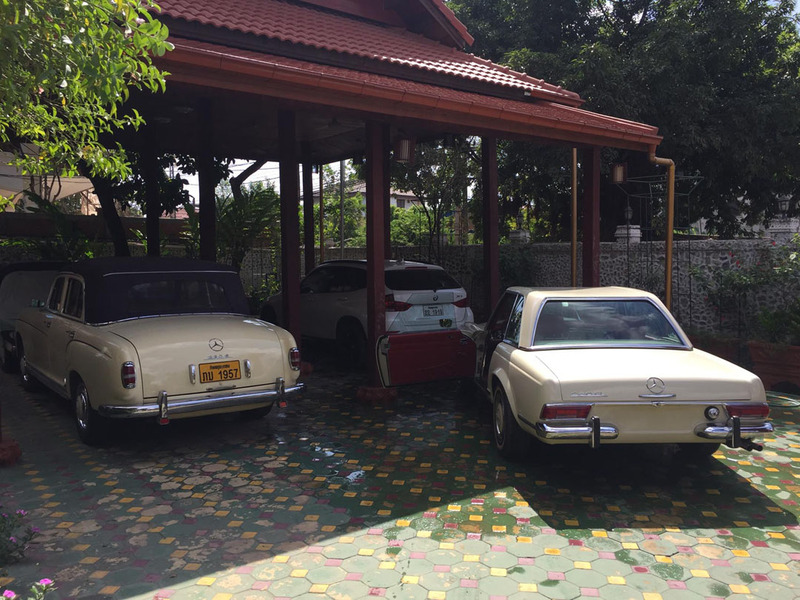 Back home with the same system. 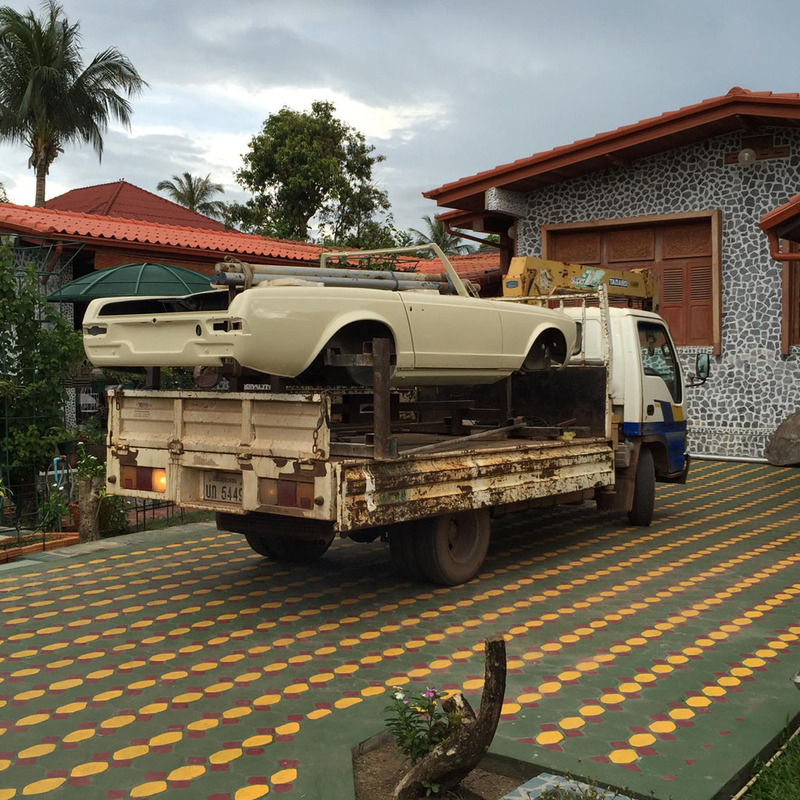 One of the quality controllers of the house – for final acceptance. Roll out - August 2016. 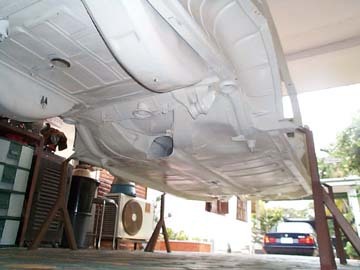 First washing for a water leakage test – near the older sister. Hard top out for drying - and photo! 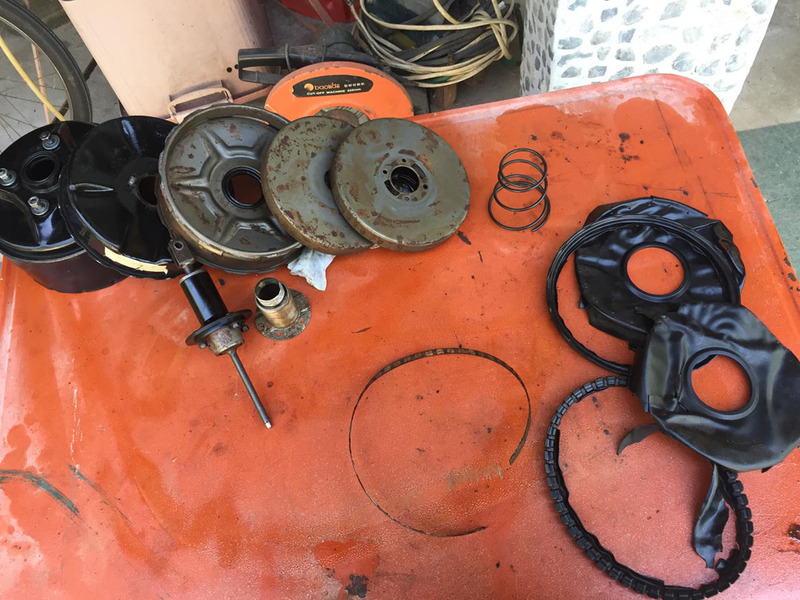 Had problems adjusting the engine because of an air leak in the brake booster. Replaced two membranes. 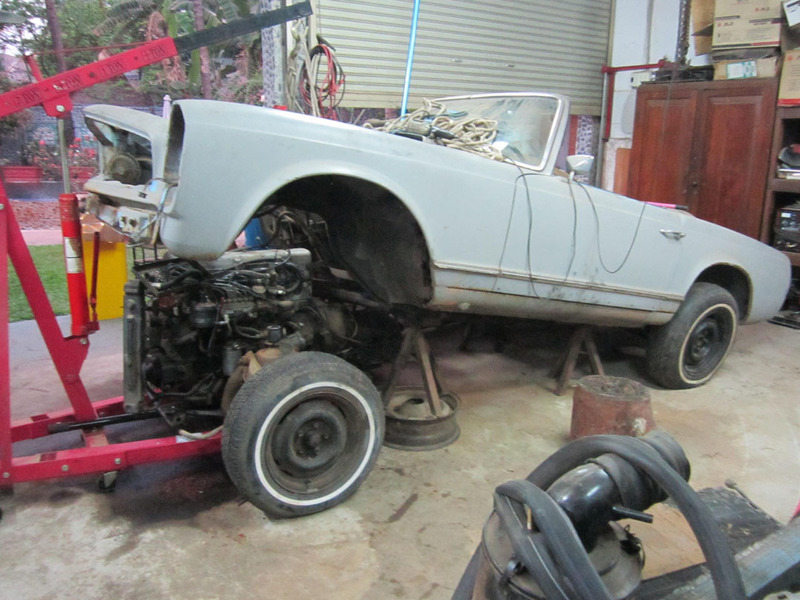 Later, also repaired the constant speed solenoid, which was completely rusted and inoperable. 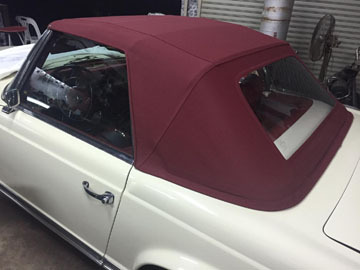 Received the kit for the new soft top. 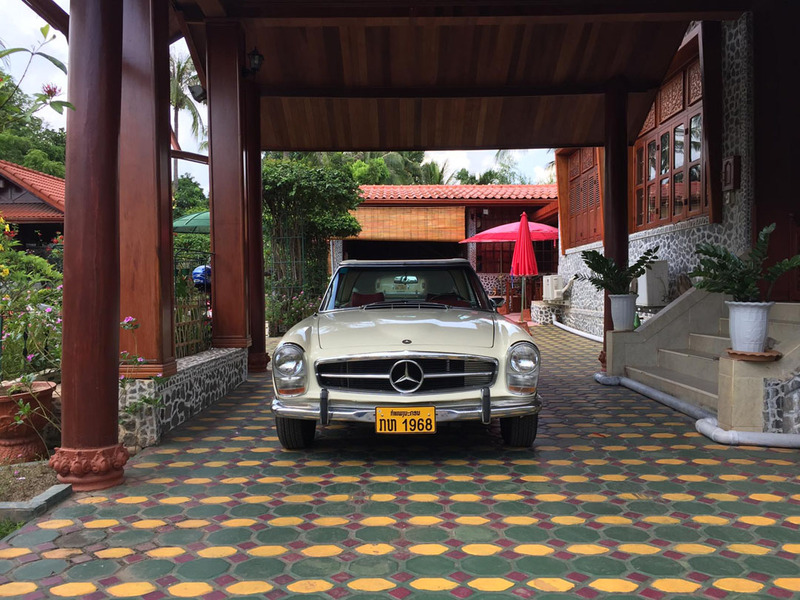 December 21, 2016 – registration completed in time for Christmas, and ready for the road. Refilling at our ML gas station. Today, I still need to change the two oil pressure switches of the automatic gear box to avoid stalling at gear changes. 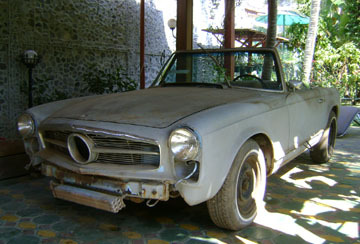 Then, need to go looking for a new Mercedes-Benz project in my mind, but that's for later.